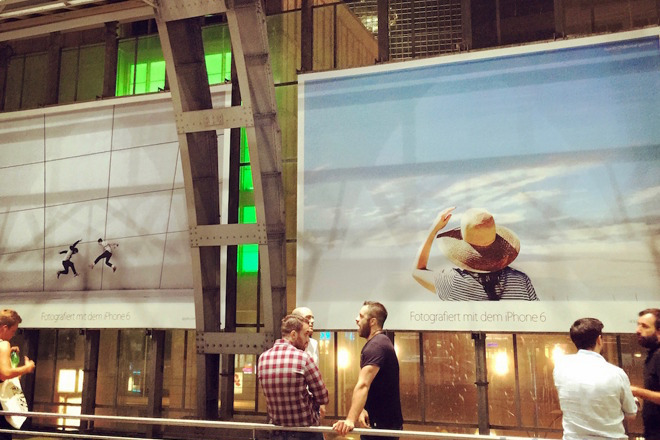 A previous Shot on iPhone campaign, as seen at Alexanderplatz, Berlin. We have no idea who shot them. There's one reason why Apple is calling its new Shot on iPhone Challenge a contest, and that's because it has no intention of actually buying any of the photographs it uses. Your best iPhone photography could end up at the heart of a nationwide billboard campaign that will cost Apple millions to deliver from concept to physical execution, and you will get nothing for it. Apple, the company about to post $84 billion earnings in a quarter, will get yet more sales. Apple's ad team will be paid, Apple's website developers will get their salary, and even the billboard company will get money. You are the only person who gets nothing, and you're the one who took this great photo that's worth advertising across the USA. You're even the only one who paid Apple so that you could have this $1000-plus phone. There is an argument that you get exposure. Please tell that to the billboard company, to the staff up put up the posters, to the print company that produces them, to the marketing team, to the drivers who transport the posters, to the gas stations they stop at. Tell it to the caterers at Apple Park who provided lunch for the meeting where this great idea was thought up. None of those people get a credit for the photo but they get paid. See if they envy you getting exposure. See if they envy you getting your name known —and then tell us how, exactly, your name is going to get you all this exposure. Not for you, it doesn't. It has a lot of cash value for Apple. We do mean you should tell us how being on a national ad campaign for free gets you a paying gig but also, specifically, tell us about how your name does this for you. Sometimes when Apple has done this before, your credit has been a byline in small print on the bottom of the poster. And to rub your face in how you're being exploited here, in previous campaigns that credit has been your first name and the initial of your surname. So if you win this contest —or if you even enter it at all —you are giving the richest company in the world free use of your work. Apple champions photography with this campaign but it insults photographers at the same time. Apple tells us that we can all be creative, but apparently it believes that only Apple can make actual money off our work. No company will spend any more money than they have to, but they have to. This kind of utter fleecing of creatives will not happen with Apple's streaming video, for instance, because the Writers' Guild of America got them to sign payment terms. This is Apple, the company whose entire history is intertwined with the creative industries. There's barely a photographer, an illustrator or an artist who isn't using Macs or iOS, and now Apple is telling us our work is worthless even when it's responsible for the company selling more devices. If you're a professional photographer, look at joining the Professional Photographers of America. And, if you're any kind of photographer at all, even a bad one, do not consider giving Apple free use of your time, talent, and images. And if you're Apple, pay for the photos. Update January 24, 10:00 p.m.: Apple has responded to criticisms including ours and now says that it will pay the ten winners of the competition for use of their photography in the campaign. It is specifically the ten winners who will be compensated and the contest's rules still allow Apple to freely use any other image entered but it is a significant and welcome reversal.